We recognize the rising costs of legal education and make every effort to manage costs while ensuring students receive the highest quality legal education. Legal education is an investment in your future. It requires careful planning, attentive management of financial resources and deliberate lifestyle choices. 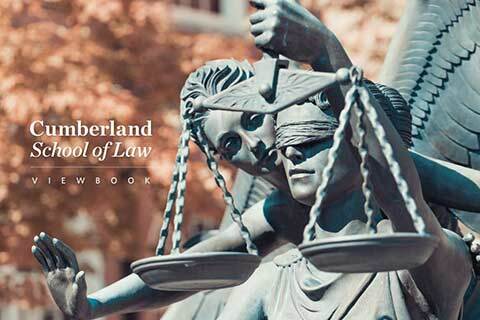 Cumberland School of Law recognizes the rising cost of legal education and makes every effort to manage costs while ensuring students receive the highest quality legal education. *The tuition and fees listed may be subject to change in future academic years. **Per semester full-time tuition is $19,800 for 10-16 credit hours. Course loads of nine credit hours or less are billed at $1,300 per credit hour. Credit hours above 16 also are billed at $1,300 per hour in addition to the per semester full time tuition. Other expenses associated with the cost of attendance are listed in the Student Budget. Samford University’s Office of Financial Aid for Graduate School is committed to helping students make informed decisions as they review and discuss various financing options available for legal education. You can get started on the financial aid process by completing the Free Application for Federal Student Aid (FAFSA) form.